Travel through the scenic Nile Valley and into the desert on this trip to discover Sudan, home to some of the friendliest people on the planet. Explore well-preserved sandstone temples, pharaonic and the pyramids of the Royal Necropolis of Meroe. Our tour begins in Khartoum, Sudan's vibrant capital city which comprises of both a permanent and nomadic population. Khartoum is located at the confluence of the White and Blue Nile and the point where the two rivers converge is called Al- Mogran. It is said that the 2 different colours of the river branches can be seen before they meet to feed the iconic Nile river. Many flights arrive into Khartoum in the early hours of the morning. For those arriving on one of these flights that will be time to freshen up and a short sleep before we begin our exploration of the city. We begin at one of the most iconic spots in the city - Al-Morgan, the confluence of the White and Blue Nile where the importance of the river and the tales of exploration that surround it give this plot of understated farmland a real feeling of history and adventure. It's then a short journey to the tomb and small museum of the Mahdi, Mohammed Ahmed, the Islamic leader of the Sudan who fought in 1885 against General Gordon and English colonisation. There are some wonderful artefacts in the museum. After lunch, where we get our first taste of Sudanese food in a local restaurant that overlooks the Nile, we make the short drive to Omdurman. Former capital city of Sudan, Omdurman is famed for its huge colourful souk. We end today in the Archaeological Museum, with its reconstructed temples, before returning to our hotel on the banks of the Nile. We stay in the Hotel Grand Holiday Villas, a comfortable colonial era hotel. Later this afternoon there is the opportunity (fixture permitting) to make a short drive to the outskirts of Khartoum and attend a Nuba wrestling match. Held in a small stadium, this traditional sport is passionately followed by local fans, as a number of teams take part during each event. There is an element of ceremony and showmanship as wrestlers select opponents before bouts begin. After breakfast we prepare to leave Khartoum, meeting the local crew of drivers and a chef who load up our 4WD vehicles. For the remainder of the trip we typically travel in comfortable Toyota Landcruisers with a maximum of 5 people, including the driver per vehicle. 4WDs are the best way to travel through the country, as many of our journeys combine tar and off-road driving. Departing Khartoum we leave behind a city that is free from the international stores and restaurants found in so many destinations around the world. Whilst this has been undoubtedly influenced by UN sanctions it does feel a visit to Khartoum is like stepping back in time. For the vast majority of today the drive is along good quality tarred roads. Once out of the city traffic is light, and it doesn't take long to get our first glimpse of the Nubian Desert. Initially the road takes us through flat desert scrub. Along the way we pass a number of commercial date plantations and small settlements. We will stop for a chai at one of the small cafes that appear intermittently along the road. These serve as a refreshment stop for the buses and trucks which are heading to and from the capital, and serve simple food and drinks. Lunch will be taken in one of these cafes and is prepared by our own chef who travels with us. Typically lunch will consist of a combination of salad, rice, stews, meat or fish complemented perhaps with foul (a local bean dish) and fresh bread from the local restaurant along with fruit for desert. We continue our journey crossing the Nile then going off road past the occasional large crescent dune before reaching the ruins of ancient Old Dongola. From the 7th to 14th centuries Old Dongola was the ancient capital of the Makuria Christian capital. Whilst little remains of the former glory, the site is dominated by the Throne Hall, which was eventually converted to a mosque and pillars from a 7th century church. Located near the Nile the site is still used as a burial spot today; there are a number of large conical brick tombs which stand alongside more simple graves in this tranquil desert setting. After visiting the site we travel for the first time through small Nubian villages before heading into the desert and look for a campsite amongst the dunes. We camp in 2 man dome tents, which the crew will help assemble, although you may wish just to lay under the stars. Soft mattresses are provided, although you should bring a sleeping bag (unless you have hired one in advance) and a pillow. Our cook will prepare a meal under the desert skies; it truly is a wonderful experience. Food is served at a table; chairs are carried to make the camping experience as comfortable as possible. A typical dinner would be soup, a meat or chicken dish, served with chips, salads or vegetable and fruit. We awake around sunrise, and can really appreciate the beauty of the desert landscape. After a hearty breakfast of crepes or omelette, cake and fruit we pack up camp and continue our exploration of this fabulous region. Heading back towards the Nile we once again drive through small villages and will stop off at one of the Nubian houses. Our groups visit a house owned by a retired teacher, Hossan and his wife, Zakaia. Here we will be served Nubian coffee and meet family members offering an insight into life in rural Sudan. Later on today we drive across the Dongola bridge and drive north on the tar road to reach Soleb. Located on the edge of what is a sleepy village at the Temple of Soleb we spend time at what is considered to be one of, if not the most beautiful Egyptian temple in Sudan. Standing as a testimony of the New Kingdom in Nubia, its many walls are rich in hieroglyphic inscriptions and bas-relief figures. Our base for this evening is only a short walk from the temple as we stay in a traditional house on the edge of the village. Here the population speaks a different language from the Arabs and the Islamic religion is not as 'strict' as in other regions of northern Sudan. The women don't cover their faces and readily speak to foreigners. Until recently many of the houses were painted and decorated with intricate patterns and flowers and although patterns are still painted within the houses, they are now less prevalent on the outside. Enthusiastic hospitality abounds - the local Nubian people will often invite visitors into their homes to share a meal or a cup of spiced tea. We stay in a large Nubian house where one of the buildings has been set up for travellers. The house consists of a number of large rooms which are very simply furnished. Each room contains from one to six beds. Often we use rooms on a twin-share basis, depending upon group size and whether others are using the rest house. For those who prefer sleeping under the stars you are welcome to put your tent up in the courtyard. There is a toilet block with four clean squat toilets and a shower block with two bucket showers. The water is refreshingly cool! There is generator electricity so camera batteries can be charged. Dinner is prepared by our own cook tonight. Those up early can wander back to the Temple of Soleb for photos in the early morning light, before we begin our journey south. Our first stop is a brief one at the remains of the Temple of Sesibi. Linked to Egypt historically, this part of Sudan seems very similar yet paradoxically is very different to southern Egypt. One of the noticeable differences is the density of people is a lot less in Sudan. Many of the villages that we drive through seem quiet, or even abandoned a reflection of the recently migration of families to Khartoum to look for work. We make our first crossing of the Nile by local ferry / pontoon. Although bridges are now being built, primarily with Chinese investments, these ferries remain important in keeping Sudan connected. Once across the Nile we continue on an asphalt road for a short distance. At one point the road cuts through the path of the old railway line constructed by General Kitchener. Now all that remains is an embankment that drifts away in the horizon, but is a poignant reminder of the turbulent history of Sudan. Eventually, heading off road again, we reach the granite boulders of the Third Cataract which used to be the third huge obstacle that the ancients Egyptians had to face when trying to sail on the Nile River. In Sebu, right on the river bank of the Nile it is possible to visit one of the richest sites of rock engraving in Sudan with hundreds of images carved from prehistoric to Egyptian times. Not far from here, among the rocks near the village of Tombos, there are the granite quarries and the remains of a huge statue of the King Taharqa, simply left there in the desert 3000 years ago. We spend this evening in Tombos, in a Nubian house. There are a number of rooms within the house, which usually have two beds. Once again, they are very simply furnished. There are a couple of western-style toilets and cold water showers. At certain times of the year part of the house is occupied by archaeologists who are working on projects in the area who can offer further insights into the region. This morning we continue to move south to the ancient city of Kerma, travelling both on and then off-road. Kerma was a city that was first settled in 2400BC. A prosperous city it was at its most powerful almost 4000 years ago when Kerma's rulers took advantage of political problems in Egypt to extend their rule to Aswan. The site is currently being worked upon by a team of archaeologists, who are unearthing more and more of the city. The most prominent remaining buildings are the famous Deffufas, the mud brick temples where ceremonies were performed. There are the east and west Deffufas, both temples very different in size and repair but incredibly fascinating. The Western Deffufa is reputed to be the second largest ancient building in Africa, only behind the Cheops Pyramid in Cairo. There is also a small museum at the site which is home to the 7 statues of the Black Pharaohs. 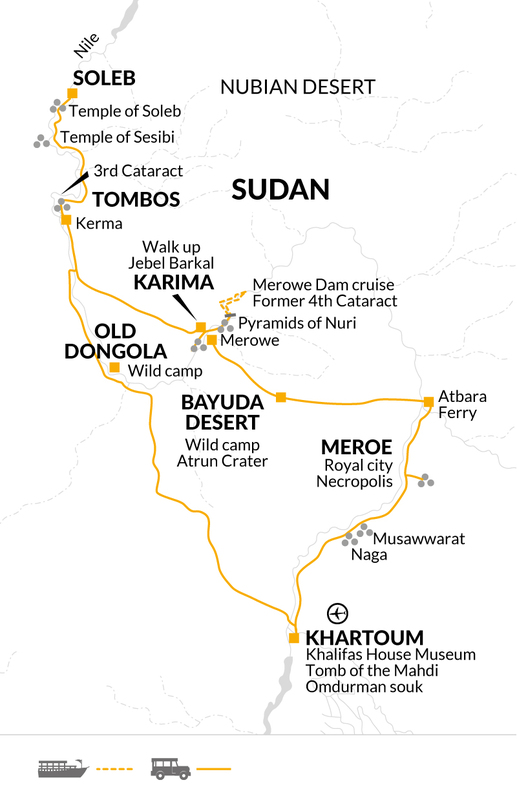 We will then drive east to cross the Nubian Desert and make our way Karima, which is by far the largest settlement since leaving Khartoum. We stay on the very edge of town in the Nubian Resthouse, a comfortable hotel which overlooks Jebel Barkal. The hotel is built in the style of a traditional rest house, around a beautiful garden. Wi-fi is intermittently available. As sun sets there's the opportunity to take a walk and to watch the sun setting over nearby pyramids. Karima lies at the foot of the Jebel Barkal. This landmark in the Nubian Desert, Jebel Barkal can be seen from many kilometres away whilst still in the open desert. At the foot of this wonderful isolated red sandstone mountain, considered holy since the ancient times, there is a large temple dedicated to the Pharaohs of the New Reign. This morning there is the option to take a walk to the summit of the mountain for sunrise. Heading up a sandy path it takes 10-15 minutes to reach the top of the hill. From the top there are fantastic views across the Nile, as well as a fantastic view of the temple below. After lunch we take a short drive to the village of El Kurru where there is the necropolis of the ancient capital, Napata. Here we visit a tomb, which was excavated in the rock under pyramids - partially collapsed - which is totally decorated with images of the Pharaoh, of the gods and multicolour hieroglyphic inscriptions. Before returning to Karima we take a short side trip through the Nubian desert and visit a petrified forest with thousands of fossilised trunks. This evening there is the opportunity to take a sunset walk to Jebel Barkal. After breakfast, we visit the market in Karima, where we get a real insight into the everyday life of the Sudanese people. The real charm of the market, and indeed Sudan is that as it has been relatively untouched by tourism there is a real authenticity to the experience. One of the specialities of this market is dried dates which make a delicious snack for the remainder of the journey. Following on from time here we once again head through the Nubian Desert with its level evenness, its sand stretches and its soft undulation. It is an almost sterile area where no vegetation survives. Until 2008 this drive would take you to the beautiful granite rocky formations of the fourth Cataract where the Nile ran turbulently among rocks forming rapids and a beautiful wild landscape, making navigation of the river very difficult. However in April 2008 the new Dam of Merowee was completed and following flooding an artificial lake was created. We take a cruise on the Nile taking the opportunity to walk on the small islands to explore the sandy beaches along the river edges. In the afternoon we cross the Nile and spend time at the Pyramids of Nuri, located a short drive from Karima. Burial place of Taharqa, recognised as perhaps the most powerful ruler of Sudan the pyramids here are amongst the oldest in Sudan and have their very own evocative charm. We cross the Nile again this morning and journey across the Bayuda Desert. There is a combination of driving on asphalt and desert trails. At times we travel through flat desert scenery, punctuated with the occasional truck stop. We take the opportunity to visit a nomadic family, who have now settled in a fixed camp and then continue before hitting the asphalt road for 100kms and then back on to desert trails to reconnect with the Nile. If we are lucky during one of our desert crossings we may see Hassania nomads in the desert. They still live the true nomadic lifestyle and gather at desert wells to collect water. Coming across such a group is like a surreal, yet humbling step back in time. Men, women and children work with donkeys to extract the water from the deep wells. Water is then loaded onto camels and taken to the desert camps. Our destination this evening will be the Atrun Crater. This area is used by nomads of the desert to gather salt and is rarely visited by tourists. A simple camp will be set up nearby where our camp crew will cook dinner under the stars. This morning we leave our camp and head towards the Nile, a pontoon (local ferry) is used to cross before we reach the royal city of Meroe. The excavations confirm that the town of Meroe used to cover a large area, and the royal city was located in a central position, surrounded by suburbs and a boundary wall. Most of the area where the city is located, formed by many small hills covered by red clay fragments, has still to be excavated by archaeologists, and may be out of bounds when visiting. We continue to our camp at Meroe. Accommodation is in fixed, comfortable tents. The tents are the large African safari style ones with 'proper' beds in them, along with a dressing table and chair. There is generator produced electricity, so phones and cameras can be charged. There is wi-fi in the main building, which houses a restaurant. The tents are not en-suite, although each tent has its own separate toilet and shower located in blocks which stand behind the tents. After lunch, later in the afternoon we visit the Royal Necropolis of Meroe which is located about 3 km from the Nile on hills covered by yellow sand dunes. It is a short drive across the desert from the camp - the adventurous may wish to walk from the camp, as the pyramids are clearly visible. Alternatively it is possible to take a camel for the 2km journey. Several pyramids stand out with their sharp shapes against the clear sky. Nubian pyramids have no mortuary room inside; the real tomb is dug inside the rock below and is connected with the outside with an inclined tunnel with a small temple at its entrance. The walls are fully decorated with bas-reliefs that show the King's life and the gods. There is the option to take a camel ride between pyramids. This morning we pack up our vehicles for the final time and join the asphalt road to Khartoum. After about an hour we make a detour once again through the desert and head to to Musawwarat El Sufra where we'll visit the Elephant and Lion Temples. Seemingly located in the middle of nowhere, surrounded by desert there is a real sense of adventure whilst standing at these temples. We then move on to the ancient site of Naga. Here we see the temple of Apedemak (1st century AD), a beautiful sandstone building with walls engraved with the images of the Meroitic Kings and gods. Nearby is another temple, in Greek-Roman style, called 'Kiosk', and another with the remains of statues of rams which was recently discovered in the sands by a German archaeological mission. This afternoon we return to the capital, Khartoum. It is noticeable that the road, which links the capital with Port Said is much busier, the pretty desert scenery becomes flat and scrub-like and more and more built up. Upon arrival we will visit the whirling dervishes. This ceremony is a dance used by Sufi practitioners to achieve religious ecstasy. Many flights departing Khartoum do so in the early hours of tomorrow morning, so your transfer to the airport could be around midnight. Our tour ends today in Khartoum. Please note many international flights leave in the very early hours of the morning, so breakfast may not be available if it's an early departure. Northern Sudan has a hot desert climate with a high variance between day and night. Winter months provide the best time to travel, from October to the end of April. The weather during this period is dry and sunny. October/November and March/April is around 30-35C during the day, dropping to 12-18C at night. December to Feburary is around 25-30C during the day and 5-10C at night. There is a fee of $20USD/€19Euros to use a video camera at all historical sites. Take some warm clothes and a fleece for chilly desert nights in the winter, as temperatures drop sharply. Knee length shorts are acceptable for men in northern Sudan, but not for women. Nevertheless, dress sensitively in accordance with Muslim traditions and avoid wearing revealing clothing, particularly in rural areas. Legs should be covered when entering a mosque and women must also cover their heads. Comfortable shoes/trainers or desert boots and sandals. One main piece of baggage which should be a soft bag or holdall, not a suitcase, plus daypack. As you are expected to carry your own luggage, we recommend that you pack light. You should bring a 2/3 season sleeping bag, inflatable pillow, towel, water bottle, insect repellent, sunhat, sunglasses, sunscreen and a head torch. Foam sleeping mats are provided. Please note during the nights spent Wild Camping the only washing facilities are a bucket and water for freshening up, there are no showers or proper toilets. Sleeping bags are available to hire locally free of charge. If you wish to do this please let us know so we can request them with our ground supplier. Accordingly you should allow US$ 35.00 per person for group tipping. £1.00 Please note alcohol is illegal in Sudan and it is not permitted to bring it in the country or to buy locally. It is advisable to take your spending money in USD cash. Limited to Khartoum and for Sudanese registered cards only. Limited to Sudanese registered cards only. Sudan: Visas are required by UK citizens and must be obtained prior to departure. Visas are required by New Zealand, Australia, USA and Canada citizens and can be obtained prior to departure from your embassy of residence or can be obtained on arrival at Khartoum International airport. Please contact us for details of the process for visas on arrival. Other nationalities should consult their local embassy or consular office. Visas for UK citizens may be obtained through the Sudanese Embassy in London. All passports must have 6 months validity, 2 consecutive empty pages and must not have an Israeli stamp. An authorisation is necessary to obtain your visa by UK, New Zealand, Australia, USA and Canada citizens. Passport details for each client are required by Explore 8 weeks prior to the tour start date. Our local partners then proceed to gain authorisation in Khartoum and provide a letter of invitation which takes approximately 3-4 weeks to obtain. Once authorisation has been obtained, UK citizens passports should attend the Sudanese Embassy in London together with the completed visa form and 1 passport size photograph or apply via our visa agency Travcour (details below). New Zealand, Australia, USA and Canada citizens must print a copy of the authorisation to travel with as it is required at check in for your flight and at least 1 passport size photograph (though we suggest an extra photo just in case) if you will be obtaining for your visa on arrival. Nothing compulsory, but we recommend protection against Tetanus and Typhoid. During winter months there are generally very few mosquitos in northern Sudan and the risk of Malaria is regarded as low. Consult your travel clinic for latest advice on different prophylaxis available against Malaria. Please check the latest requirements with your travel clinic or doctor prior to departure. The above is not an exhaustive list. Further information regarding vaccinations and travel health advice can be found by following the NHS and NaTHNaC links at Explore Travel Health and from your local healthcare provider. Visa and vaccination requirements are subject to change and should be confirmed by you before travelling. On our April and October 2019 departures you can book a single room for just £1! Please see the Dates and Prices section below for exact dates. Subject to availibility.